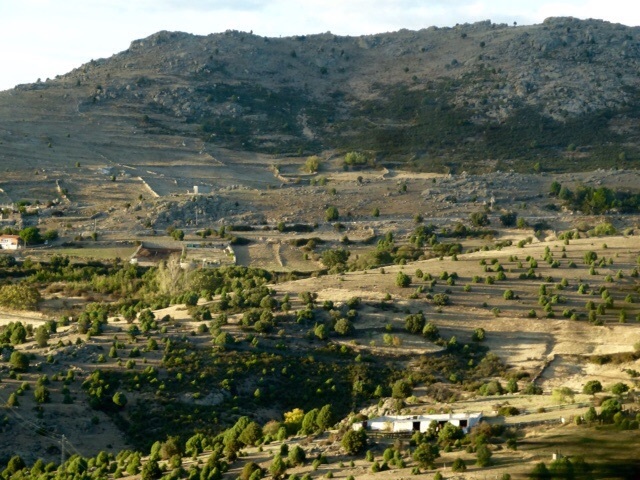 Today we visit Avila, which is the highest provincial capital in Spain, at 3,710′ or 1131 m. above sea level. In winter the access roads are sometimes blocked with snow, but I wonder if that is because there is so much snow or if it is because they don’t have the kind of snow removal vehicles we have in Alberta? 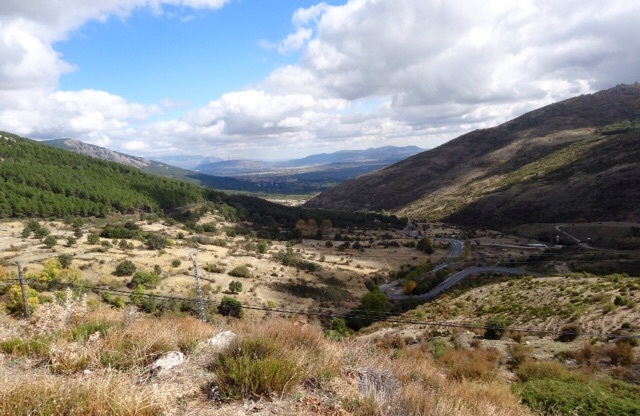 The drive is through interesting countryside, which changes every few miles. We seem to be always either climbing or descending winding roads. There certainly aren’t many long straight stretches of road, even the freeways meander. 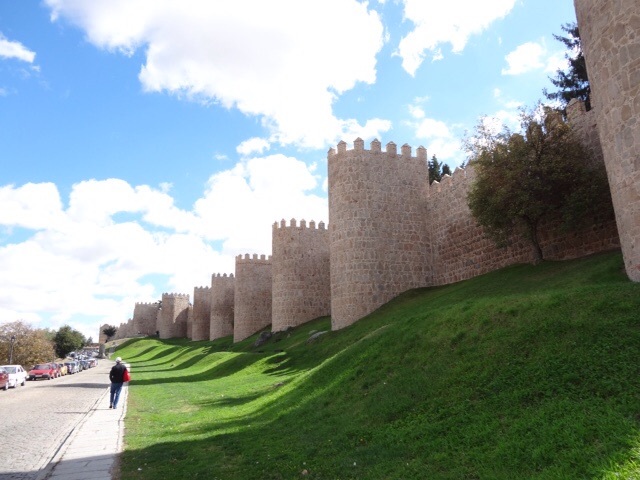 In about an hour we arrive in Avila and get our first look at the Medieval walls that encircle the city center. We find a parking spot on the street and we are shocked that 30 cents gives us five hours of parking! 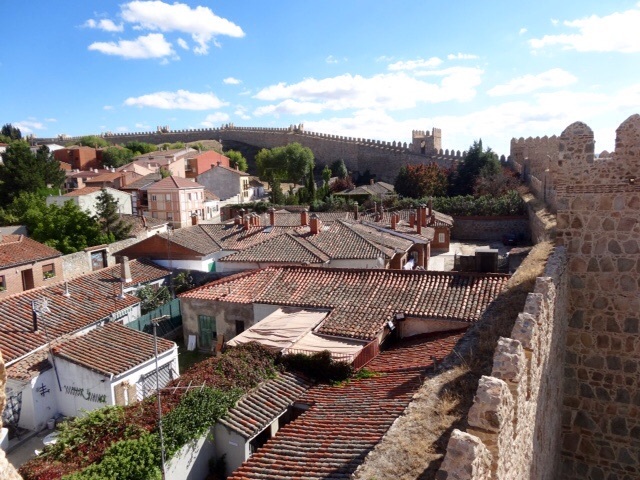 A great improvement over Segovia yesterday when it cost us more than 9€ for less time. 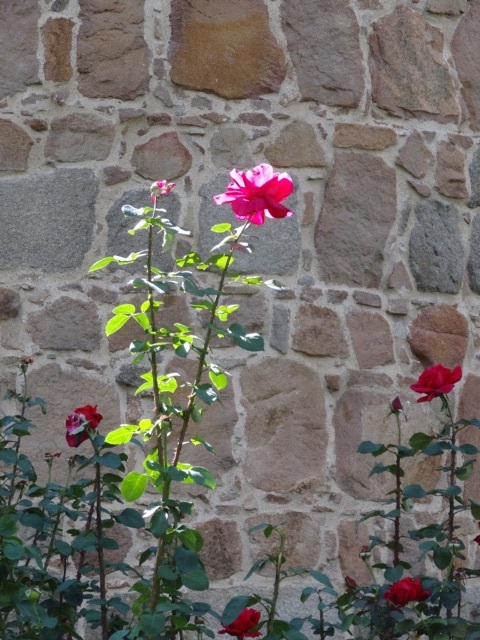 The walls are very beautiful with ochre, pink and bluish toned stones arranged in an attractive pattern. 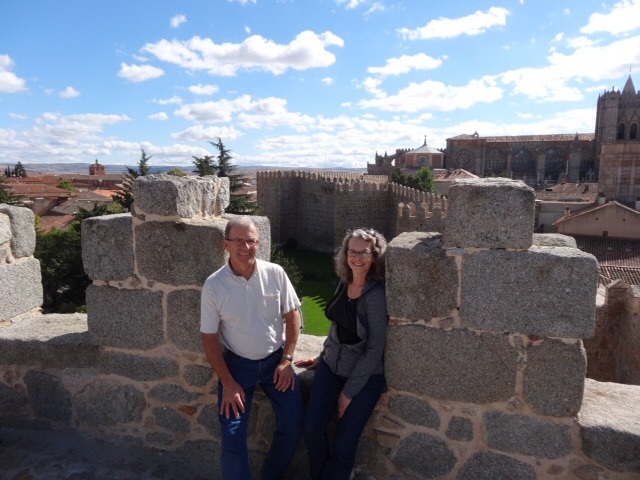 It took some doing, but we finally found the entrance to climb the tower walls and we find ourselves on top of the finest preserved Medieval walls in all of Europe. 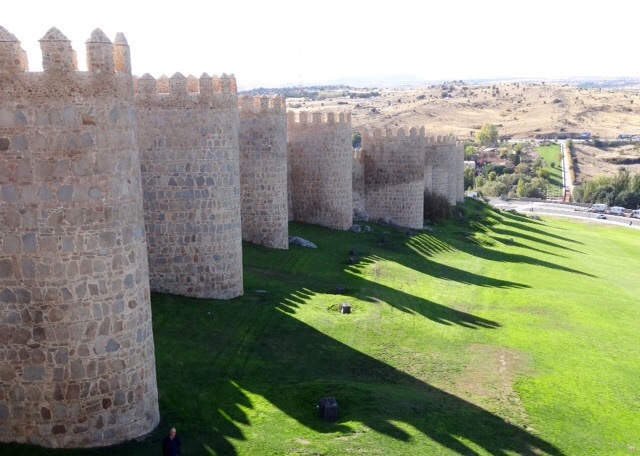 These walls were built in the 11th Century and they are punctuated with 88 cylindrical towers. We are able to climb up into many of these towers. The apse of the city’s cathedral, in the background, also forms part of the walls. 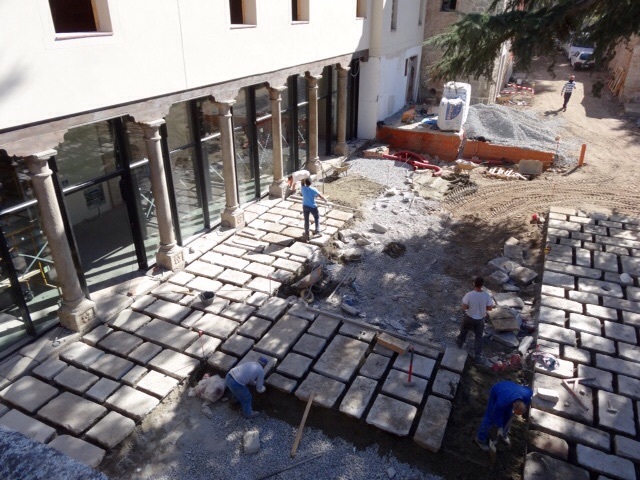 We stop and look down into a courtyard watching workers lay huge stone blocks for a walkway or perhaps a patio. They are very good, and get the stones in the right position and almost level on the first try. Bob has laid a lot of bricks in our yard and he knows this is not as easy as these guys make it look. These walls are almost two kilometers long and we walk as far as we can. Part of the walls have not been restored and we are are not able to walk on them. 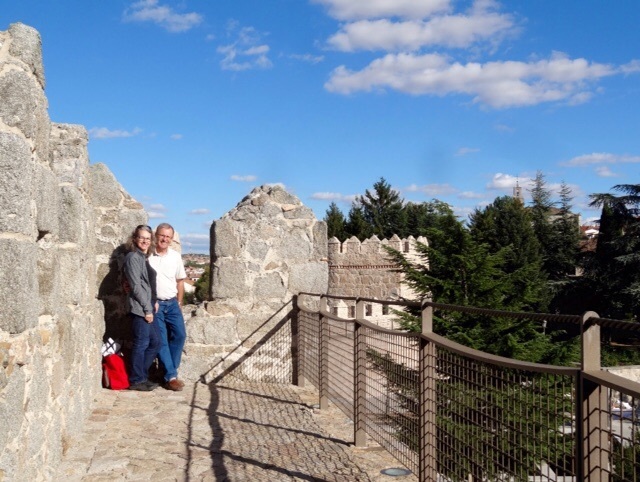 Here we are near the end of the walkable part of the wall, now we have to turn around and go all the way back, but first we stop and have tea and cookies at one of the many towers. It is incredible to think that we are walking the tops of these ancient walls, and it is easy to imagine soldiers standing in the same spots we are, defending their city from invaders over a thousand years ago. In Canada there aren’t any buildings or structures that are anywhere near that old. Columbus didn’t even discover North America until 1492! The sun casts long shadows as we make our way back to our car. 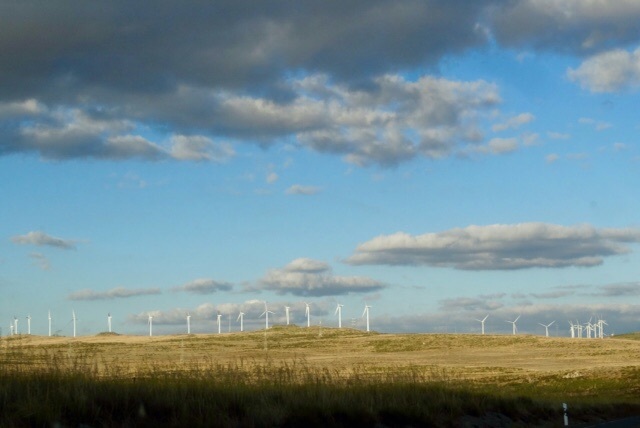 It has been quite windy since we left Northern Spain, and we have seen lots and lots of these windmills. There are stone fences everywhere, even in areas that look as if they were abandoned long ago. I really love all the stone walls and fences: it makes me want to build something out of stone! 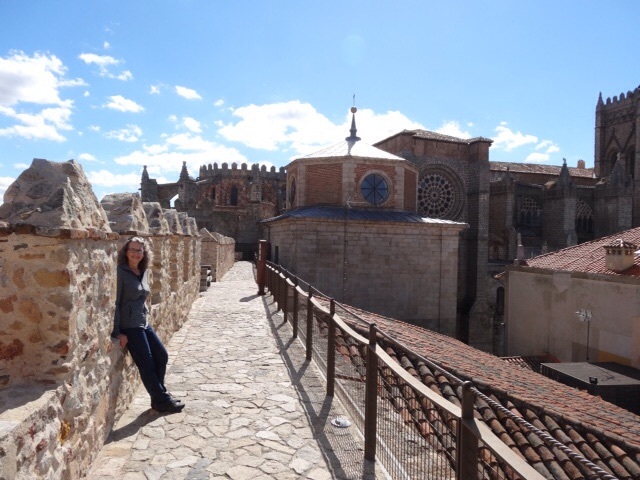 This entry was posted in Avila, Catacombes, Historic Buildings, Medieval Walls, Spain and tagged Medivieval, Spain, Vacation by Trudy. Bookmark the permalink. Thank you for the armchair tour, I am loving every minute of it. Thanks Rosa, Glad you are along for the ride. Enjoyed seeing the green grass since we don’t see much of that here during the drought! We stayed at a hotel here in Riverside ,CA that resembled the photo you posed in!